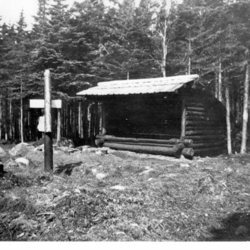 The Bigelow Mountain Shelter, pictured here sometime in the 1950s, was removed from the Appalachian Trail in the 1960s. It is a typical version of the log sided Adirondack style lean-to favored by the early shelter builders. It was located just south of the current Horns Pond Shelter. 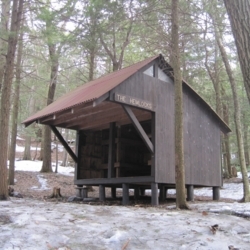 From the back of the image: "Lean-to on the Appalachian Trail on the conifer-covered slopes of Mt. Bigelow in Maine. Here the Appalachian Trail and the Bigelow Range Trails meet, affording a crest line route of 20 miles along Mt. Bigelow." 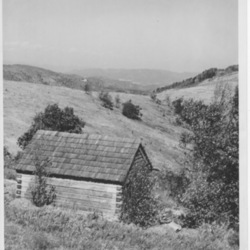 The Big Flat Shelter in Shenandoah National Park, c. 1940s. 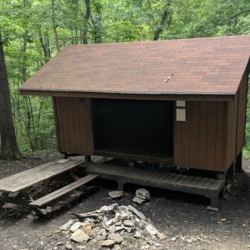 This shelter was built by volunteers from the Potomac Appalachian Trail Club in the 1940s and was removed at some point in the 1960s due to the creation of the Loft Mountain Campground in the Park. Records on the exact location of the shelter are hazy at best. Those who have researched the location of the former shelter place it, most likely, at the site of the current amphitheater in the campground facility. The Trimpi Shelter is a stone shelter built in 1975 and located in Southern Virginia just north of Troutville. This shelter is maintained by the Mt. Rogers Appalachian Trail Club. 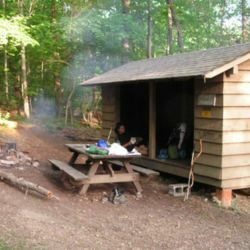 The Cove Mountain Shelter in Pennsylvania is located just south of Duncannon and the Susquehanna River. 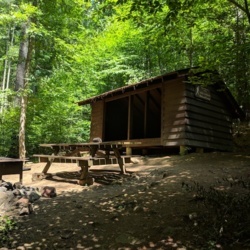 The shelter was built in 2002 by volunteers from the Mountain Club of Maryland near the site of the former Thelma Marks Shelter, which was the scene of the murder of Molly LaRue and Geoffrey Hood by Paul David Crews in September 1990. The Darlington Shelter in Pennsylvania is a replacement for the original Darlington Shelter built in 1956 by Earl Shaffer, the first person to thru hike the Appalachian Trail in 1948. 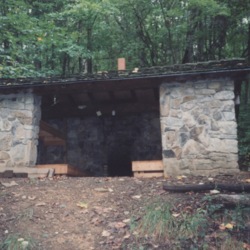 The shelter Shaffer built was replaced by the current structure in 1977 by the Mountain Club of Maryland, which still maintains the shelter. The shelter is named for Bishop James Henry Darlington, an early advocate of the Appalachian Trail. Alexander (Alec) Kennedy was one of the founders of the Mountain Club of Maryland in 1934 and also served as a president of that club. After his death in 1989, club members built the Alec Kennedy shelter in his memory. 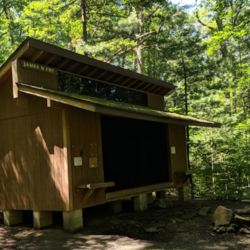 The James Fry Shelter is located just north of Pine Grove Furnace State Park in Pennsylvania. 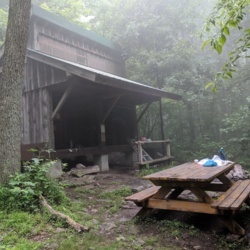 It was built as a replacement for the Tagg Run Shelter sometime in the 1970s and is maintained by the Mountain Club of Maryland. 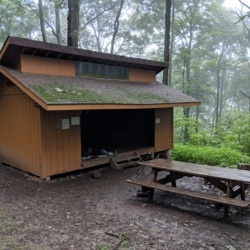 The Toms Run Shelters are the last of the paired shelters in Southern Pennsylvania that northbound hikers experience as they approach the halfway point of the Trail, or the first of the paired shelters that southbound hikers come to on their way toward Maryland. 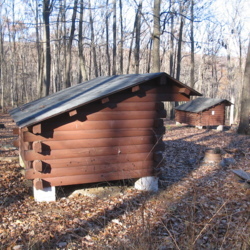 The paired shelters of southern Pennsylvania are a unique feature of the Appalachian Trail in this region. They are maintained by volunteers of the Potomac Appalachian Trail Club. 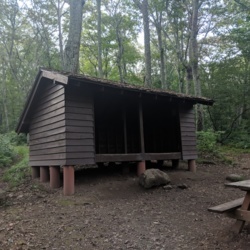 The Hemlocks Shelter in Massachusetts is the southernmost shelter on the Appalachian Trail in Massachusetts and was built in 1999 by volunteers from the Massachusetts AT Committee. It is adjacent to the Glen Brook Shelter.